Copper has managed to break out of the triangle pattern, with prices now approaching the USD2.2735 high of July. 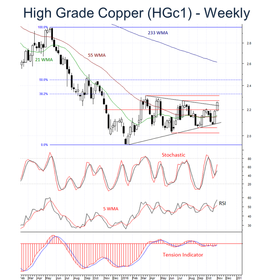 There is risk of a short-term corrective pullback, as daily studies unwind, before a clear break opens up critical resistance at the USD2.3145 high of March. A subsequent close above here will confirm a significant low in place from January, with a multi-month rally then looked for, as background readings continue to improve and investors adopt an outright bullish stance. Support is at congestion around USD2.2000 and extends to the USD2.1895 low of 31 October. A break of here will open up lows down to the January trendline and USD2.0800 low of October, but this area should underpin any tests as investors maintain a buy-into-weakness strategy. To access the full report, covering Gold, Crude Oil futures, High Grade Copper futures and Corn futures, please click here.